We are an Multi Zone Paging System manufacturer in India. We have been supplying our products to private, public and government companies in India. For Better Understanding of our customer we have given alternate name of the product also. Select the required zone, say zone 1. Speak through the Mic of the Zone console. This announcement will be heard through all the speakers in zone 1. Similarly, announcement to the other 5 zones and All – Call can be made. 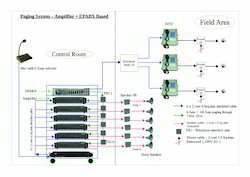 The EPABX unit is connected to all the industrial telephone extensions in the field. All the normal intercom functions happen between the extensions connected to the EPABX. Page announcement through EPABX extensions is done as given below. For 6 zone paging, six nos. of telephones interface units (TIUs) are used. For the six zones, six telephone extension numbers are assigned and each telephone extension is connected to a TIU. The audio output from each of the six TIUs is fed to the amplifiers of zone 1 to zone 6. Suppose, the operator wishes to make page announcement to zone 1. He lifts the handset of his telephone extension and dials extension number, say 201, assigned to zone 1 paging. The call lands at TIU 1, the ringing stops and now the operator can announce the message. This announcement is heard thro' all the speakers in zone 1 area. For all other zones, a similar procedure should be adopted. For all zone paging, the operator should dial the extension, say 207, assigned to all zone paging and proceed as before. The announcement will be heard in all the zones. The field operators can also make zone wise paging or all zone paging by following the procedure indicated above. Looking for Multi Zone Paging System ?